William Herschel's discovery of infrared light in 1800 led to the development of astronomy at wavelengths other than the optical. Infrared Astronomy - Seeing the Heat: from William Herschel to the Herschel Space Observatory explores the work in astronomy that relies on observations in the infrared. Author David L. Clements, a distinguished academic and science fiction writer, delves into how the universe works, from the planets in our own Solar System to the universe as a whole. The book first presents the major telescopes in the world of observational infrared astronomy, explains how infrared light is detected through various kinds of telescopes, and describes practical problems that send infrared astronomers to the tops of mountains and their telescopes into orbit and beyond. Much of the book focuses on what infrared astronomers find in their observations. You'll discover what infrared astronomy reveals about the planets, moons, and other bodies that constitute our Solar System; star formation and stellar evolution; the processes that shape galaxies; and dark energy and dark matter. Infrared astronomy has revolutionized our understanding of the universe and has become essential in studying cosmology. Accessible to amateur astronomers, this book presents an overview of the science and technology associated with infrared astronomy. With color figures, it shows you how infrared astronomy provides insights into the workings of the universe that are unavailable at other wavelengths. "... provides a coherent entrance to a majority of the 'hottest' current topics in astronomy generally but allows doing so with a smaller burden of prior material. The book is clearly written with simple and useful diagrams. Each chapter starts with an anecdote, usually about the author, which lends a personal dimension to the discussion and should help general education students identify with the topics. This also lends the book a certain charm for those who might just read it on their own." "Astronomer Clements gives an excellent and thorough account of the history of infrared astronomy, covering details of the apparatus as well as the astrophysics involved. 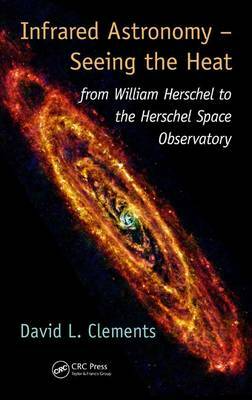 His work with the Herschel Space Observatory, which was active from 2009 to 2013, informs the book. ... This book contains helpful illustrations and some color photographs ... Recommended. Graduate students through professionals and practitioners." "... a fine reference for anyone who would understand the latest findings on infrared. The fact that it's accessible by a much wider audience than graduate astronomy readers sets this coverage well apart from competitors, making it a recommendation for students, grads, and even the general reading public with an interest in astronomy." "David Clements has done something remarkable. He has written a book on infrared astronomy with a comprehensive perspective but which does not require a mathematical background to understand. This book will suit anyone from a scientifically motivated member of the general public through the enthusiastic amateur astronomer. If your aim is to know the why and wherefore of the observational field of astronomy that has expanded most in the last two to three decades but not the how, this is for you. At the same time, David leavens the science with personal anecdotes that give a sense of how it feels being a researcher `out on the final frontier.' It makes a very good read." "In this elegantly structured and well-written book, David Clements presents a thorough account of infrared astronomy in the context of the wider scope of multi-wavelength astronomy. He covers the historical development of the field and provides an up-to-date summary of current research and how it is exploring the universe from our own Solar System to the most distant galaxies and the big bang. This book conveys a clear understanding of astronomical techniques and discoveries as well as a real sense of excitement at the astonishing progress made in the last decade, and new facilities that promise more to come. Technical and scientific concepts are expertly and engagingly explained without dumbing down, making the book an ideal and very accessible overview of modern astronomy for the general public, students, and teachers." "David Clements's book, crisply written, generously illustrated, adorned with personal insights, and bang up to date, is a fine introduction to infrared astronomy and the wider field of which that subject is a part. But more than that, the book is a celebration of the imagination. In his first chapter, Clements describes how William Herschel, in the year 1800, tried an audacious experiment to detect the effect of light beyond the visible spectrum. This could have been done by others before-perhaps as far back in time as the ancient Greeks-but, just as with other great moments of the modern enlightenment, Herschel's key experimental apparatus was his own mind: his ability to imagine that such light might exist and might be detected. Since then, thanks to workers, including Clements himself, Herschel's extension of our senses has led to unfolding and continuing discoveries about the nature of the universe around us. In addition to his academic qualifications, Clements is a published science fiction author, and his book is suffused with a fiction writer's sense of wonder at the universe we will continue to explore, as long as, like Herschel, we have the imagination to do so."